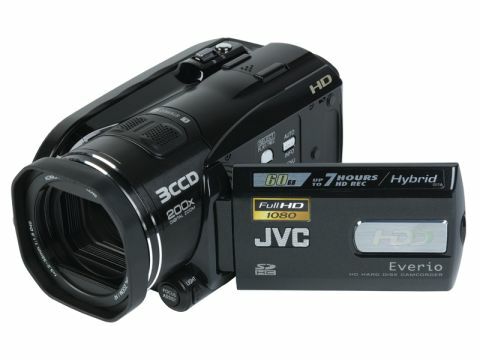 A rather large camcorder, the JVC GZ-HD3 is built like a brick. Though no less pretty to look at than its rivals, it offers the sort of robustness and build quality that ensures that it'll appeal more to the serious videomaker for whom precise control, stability and high-quality images are of a premium. It might not offer the more professional lens rings that more discerning users demand, but the joystick that is utilised for manual operation is sensibly positioned on the surround of the LCD screen, making it easy to use and about as accurate a way of making adjustments as we've seen. This is a hybrid offering that can record either to a removable SD card or to the 60GB hard drive. There are three recording modes offering a maximum shooting time of 7hrs (at a reduced quality) or 4hrs 56mins at the highest resolution of 1440 x 1080 (at a constant bitrate). This isn't a Full HD resolution, but viewed on a 42in LCD screen, pictures don't appear to suffer as a result. Manual controls include the usual focus and white balance, aperture and shutter speed for setting exposure, as well as options for adjusting brightness and sharpness. To help ensure pictures are properly calibrated there's also a colour bars mode and exposure can be checked using the zebra patterning. There's an input for a separate microphone and an in-camera mode for altering the sound levels to your liking. The HD3 underlines its superiority almost immediately. It does everything that its rivals can with the minimum of fuss, but proves perhaps most impressive in the areas where most cams suffer. Performance in challenging light conditions provides certainly the best example of this. Shooting under artificial lights where images usually suffer an unnatural yellow glow, colours are resolved as the eye sees them, the focus is free from hunting and there is nothing in the way of grain evident. Low light conditions suffer a slight drop off in these qualities, but pictures are still miles ahead of many other HD cams. Unsurprisingly, though, it's good natural daylight that allows the HD3 to realise its true potential and underline why HD is set to become the norm. Colours are immaculately recreated, motion is free from blur and the auto systems perform with precision and alacrity. But it's the level of detail that really impresses us. Whether it is insects crawling in the grass, the imperfections on a subject's face or the flecks of dirt in a carpet, nothing comes close to matching the Konica Minolta lens' eye for detail. The HD3 is quite clearly head and shoulders above many of the competition for both first-timers and more discerning videomakers. It might not be as portable or lightweight, but the stunning pictures that it captures make it just too good to ignore.